This wine is a unique blend in Thailand between our estate grown Syrah and a small percentage of Viognier. Syrah for this blend was picked from eleven year-old blocks of Syrah vines on a slope with darker soil and good drainage. The grapes were hand harvested in the cool mornings of February at 23-24°Brix and sorted. Fully-ripened Viognier was picked at the same time for co-fermention with the Syrah. This wine is full bodied with aromatic nose of red berries, cassis, red gummi bears and distinctive black pepper. The palate shows arrays of red berries, dark cherries and lifted floral notes, vanilla and freshly cracked pepper with great acid backbone. 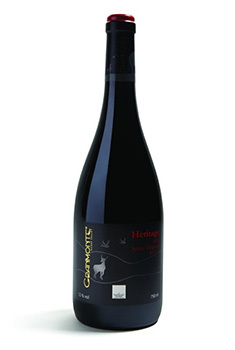 Young, with ripe and rich fruity flavor of black currant and cherry, it is smooth with full yet velvety tannins. Balanced in body with long juicy finish of toasted coconut and chocolate. It is pleasurable drinking on its own or with food. This Syrah Viognier is crafted to be enjoyed with a few years of cellaring and will improve with age. Drink now-2022.